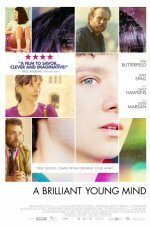 “A Brilliant Young Mind” – “X+Y”(original title) a Great Movie! Nathan, diagnosed with Autism is mathematical genius. He is also shy and an introvert. He is assigned a high-school coach, Mr. Humphreys, who coaches Nathan and explains to Nathan how he could enter the International Mathematics Olympiad because he is a mathematical genius; Mr. Humphreys is a former International Mathematics International participant. This is a film is funny, it’s touching, and it’s romantic. The characters were great, especially Nathan. This movie is playing a the Scottsdale Camelview Theatre. Go see it! !